This powerful forgiveness tool enables us to clear and cleanse any discord or disharmony. We are able to “make right” with those we have an issue with and this in turn allows us to “make right” with our ancestors. We can heal issues within our family and heal those traits within our ancestral line. Of course when we forgive others we are ultimately forgiving ourselves. Historically Ho’oponopono healing system was conducted in the presence of Hawaiian elders who facilitated the healing process for those with a dispute or misunderstanding. This would frequently be in family circles whereby the whole family had to be present, nobody could be absent. The group present would interact to enable the clearing process to take place and each member had the chance to ask for and receive forgiveness from the others. “The process begins with prayer. A statement of the problem is made, and the transgression discussed. Family members are expected to work problems through and cooperate, not “hold fast to the fault”. One or more periods of silence may be taken for reflection on the entanglement of emotions and injuries. Everyone’s feelings are acknowledged. Then confession, repentance and forgiveness take place. Everyone releases (kala) each other, letting go. They cut off the past (ʻoki), and together they close the event with a ceremonial feast, called pani, which often included eating limu kala or kala seaweed, symbolic of the release” – Nana I Ke Kumu (Look To The Source) by Mary K. Pukui, E.W Haertig, Catharine Lee. Morrnah Nalamaku Simeona, a renouned kahuna lapaʻau (healer), updated the Ho’oponopono process in the 1970s so that it was no longer a requirement to have the elder or healer present. Morrnah developed “Self I-dentity through Ho’oponopono” which uses techniques to create a working partnership among the three parts of the mind or self; subconscious, conscious and superconscious. She taught and promoted this updated technique around the world. Ho’oponopono allows us to reclaim our personal inner connection with Love, our Divine Source, resulting in Peace, Harmony and Freedom. The process was further updated by Dr. Ihaleakala who worked closely with Morrnah for many years. These updates made the process easier for our modern times and changing needs. 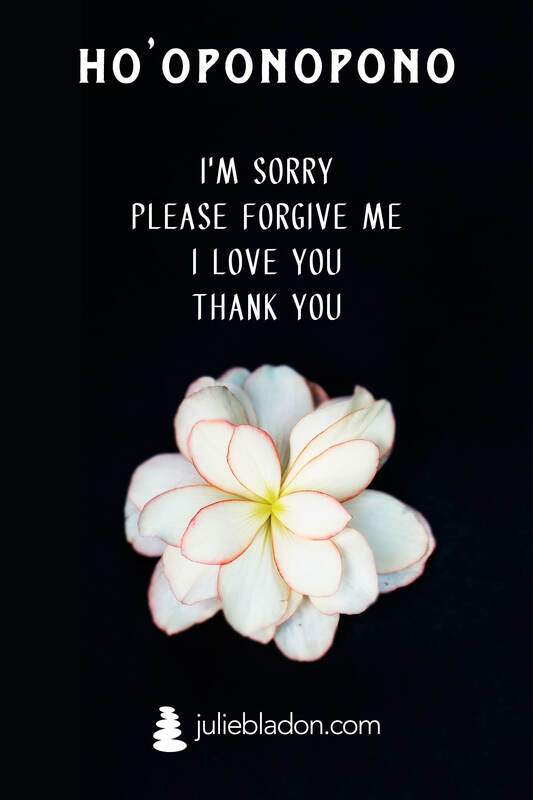 Ho’oponopono can be seen as a mantra where the individual repeats the words ‘I’m sorry, please forgive me, thank you, I love you’ as a form of mental and spiritual clearing. The practice goes to a deeper level than maybe initially perceived. The reciting of the mantra acts as a forgiveness practice and cleanses the origin of the problem. We can also understand that there is no “out there” to heal and we are ultimately healing what is inside of us and all of our memories. Try not to overcomplicate this process and do not get stuck in trying to understand it all. Trust in the process and try it in your life for deep personal healing. You may find questions arising such as “Why should I be sorry? Why do I need forgiveness? Do I really love them? What am I thankful for?” Stick with the practice and the intention. You may find your thoughts are churned as you start this practice but be patient and learn to observe. Try not to overthink. Let the practice take you to a place of calmness and stillness. You are aligning, clearing and healing the issues on a profound level. Ultimately you are developing personal power and responsibility to heal the situation. By doing this practice you tap into unity consciousness and the wider awareness that ‘you are in me and I am in you’. You will heal both yourself and the wider world. This stuff works for everybody! Try using it in your personal and professional life. Click here to read my article on Lomi Lomi massage and 7 Principles of Huna which was published in Inspired Times Magazine. Check out Inspired Times Magazine. It’s FREE online or you can order a paper edition for £6. Creative, informative, uplifting with features on yoga, spirituality, eco issues, travel, health and much much more! Welcome to my brand new website! Over the last few months I have been busy working with Will from Atwork and web developer Rupert to create a brand new look and website. The aim has been to freshen things up, create a more user friendly and searchable website plus create a space for blogging. I hope the website is easy to navigate. You will find sections on Yoga, Meditation, Lomi Lomi and Events which includes all weekly yoga classes, yoga workshops and retreats. The Shop features classes, workshops, CDs and downloads plus yoga products. My aim is to add more items and products to the shop so please drop by regularly to find out what’s new. I will be blogging regularly and sending a FREE guided meditation each month to my e-list. Email subscribers will receive exclusive updates, news and free guided meditations. You can join my email list here. Do let me know what you think of the new website and also contact me with any Yoga, Lomi Lomi or natural health topics you would like me to cover in my blogs. Finally a quick thank you to Exeter based photographer, Helen Lisk, for my new photos and to Devon based professional make-up artist, Eve Ashby, for my make-up for the photo shoot. Huna philosophy and the changed outlook on life can help individuals achieve closer and more loving personal relationships, both at home and at work. Dramatic improvements occur in all areas of life. The state of your mind affects your emotions and Huna can free locked up memories and emotional states. You become capable of successfully treating harmful addictions, insomnia, migraine and depression, as well as breaking destructive habits as you learn a healthier, happier and more harmonious way of living your life. The spiritual essence of the Huna philosophy is that all power comes from within. Huna teaches us to listen to our inner self, to develop intuition and to balance your seven energy centres or chakras through meditation, breathwork and healing.